The Manchester green summit was the focus of our last #greenroofpoll. 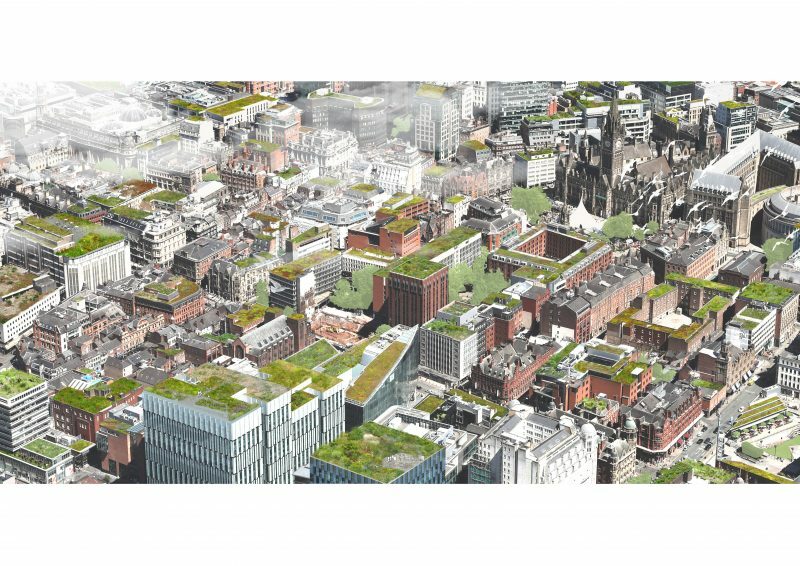 Ahead of the summit, city centre-based practice AFL Architects pioneered a campaign to encourage the implementation of biodiverse roofs on all large-scale Greater Manchester buildings. In partnership with AFL, Livingroofs.org undertook a short green roof poll. Of course from our perspective, the purpose of the poll was to encourage a policy shift to create #gladesinthesky across the whole Northern Forest – not just in Manchester. The Green Summit this week in Manchester will create a green road map to be the greenest cities in Europe – #greeningmanchester . ‘The Green Summit was a great event for Manchester. The discussions and speeches on stage were inspirational, and established that we are now actively moving forward with ideas and initiatives that will positively impact the future landscape of our city and surrounding areas. As these discussions further mature, we are confident that green roofs will become a fundamental part of developmental policy if the area’s ambitions are to be sustainable in the long term. As for the discussions themselves, they revolved around the culmination of ‘listening events’. These had taken place over the previous three month period covering subjects from transport to buildings and environment to wellbeing. Reducing plastic waste was particularly high on the agenda. These listening events all manifested in a series of curated rooms where the common themes were consolidated and attendees could review and comment further online or through suggestion slips. Overall my view was that the process surrounding the event was impactful and created great discussion, while the summit itself was more of a political milestone with not much new hard policy coming out. Perhaps it was too early as the ideas need to be disseminated and refined before rushing into political statements. The great outcome of the whole Greater Manchester Green City idea is that the discussion has been started and fabulous ideas aired and shared in one process. I understand it has been decided that the Green Summit will now take place annually, and I am certainly looking forward to future summits. Now let’s hope that the best ideas are moved forward – including green roofs! The Future of green roofs in the Northern Forest? Whilst it is too early to know whether green roofs will become part of greening Manchester, we are sure that in time, like other cities across the globe, they will be embraced by the city. Furthermore, we are sure they will also be embraced by other cities across the Northern Forest region. And the Northern Forest will also be a region of #gladesinthesky.